Let's talk relationships. No, we're not becoming a dating agency! We're referring to the relationship between the DJ and their client; that magical, invisible and mystical thing that could determine whether you get the job or not, whether your client gushes at you or just thanks you politely at the end of the night. Surely the DJ is just a supplier so is it really necessary to build a relationship? An extensive survey suggests that if the client likes you, they are more likely to book you. Indeed, from our own ongoing survey of thousands of clients who use the AMPdj enquiry system, when asked why they chose their particular DJ, 75% said it was because they just clicked and ultimately felt they could trust him/her with their event. Dealing directly with clients is all about building up a rapport and developing a good relationship. There are many small things we can do to aid this process and thus encourage a client to book us without pushing our service or price becoming the deciding factor. It is all about being client focused, letting them know you care and they are important enough for you to remember things about them. For example . . . The second time I visited a particular butcher, I was amazed that he had remembered the conversation from a fortnight ago about my inability to cook. He immediately produced a pre-prepared roast joint for two, giving full cooking instructions. Now, I don't go anywhere else for my meat. He isn't cheaper or particularly better than other butchers but he made me feel special and important, and still does on a weekly basis. Relating that same customer service to the DJ business, remembering small things about our clients and recalling them at a later date will make them feel special and valued. After a conversation with your client, either on the phone or at a meeting, jot down anything said such as reference to children, recent holiday, how they met their partner etc. The next time you speak to them, even if it is at the event itself, drop these recollections into the conversation. When you meet a client face to face, your body language will tell its own story. A smile can break down a hundred barriers and can make your client feel more at ease. A firm handshake and plenty of eye contact ensures you come over as confident and interested. If you are meeting more than one person, ensure you make equal eye contact rather than focusing on one person. If you are meeting your client for the first time at the event, take time from setting up to greet them warmly and introduce yourself. Don't be afraid to talk to guests; the event will be much more successful if they like you too. When sitting opposite your client, crossing your legs or your arms is a silent message that you are not open to them and could come across as disinterested. People like someone they can trust, and tend to trust someone they like. It's often the small things that build this confidence such as replying promptly to emails or phone calls, or small reassurances such as familiarity with the venue and comments from previous clients. Greetings cards are both a nice touch and a useful one. Always sign with your real name and the name of your disco. For a wedding, birthday or anniversary, take a card on the day to the gig. If you have bookings for the following year, send a Christmas card to all your clients. Cards and stamps are inexpensive but can make a massive difference to building rapport. Be useful. Even if it doesn't benefit you, be helpful such as putting them in touch with other suppliers etc. Honesty. Even a small untruth could cause mistrust. If you make a mistake, be prepared to own up and apologise, you are much more likely to be forgiven for being honest and the trust is still intact. True to your word. If you say you are going to phone on a certain day, or post something, make sure it happens. No nasty surprises. If you are a cross dresser with pink hair, make sure your client is aware. Not 'just another client'. Treat each client as a person, not a means of making money; the relationship will be stronger. Reward loyalty. If a previous client returns for further bookings, show your appreciation by offering a discount or adding an additional service for them for free. Clients might not be able to pinpoint what it is about you that made you special, but you'll know. You should find that your referrals will also increase. 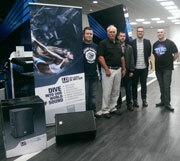 Congratulations to Peter Fisher of Excalibur Roadshow, East Yorkshire - the winner of a pair of LD Systems active speakers in our AMPdj Spring Competition. Thanks to all who entered and to Adam Hall for their generosity.